The new CS Series commercial mixer amplifiers from JBL are the next generation in commercial sound. The CSMA1120 allows you to connect up to 4 different sources like CD players, satellite receivers, and MP3 players. 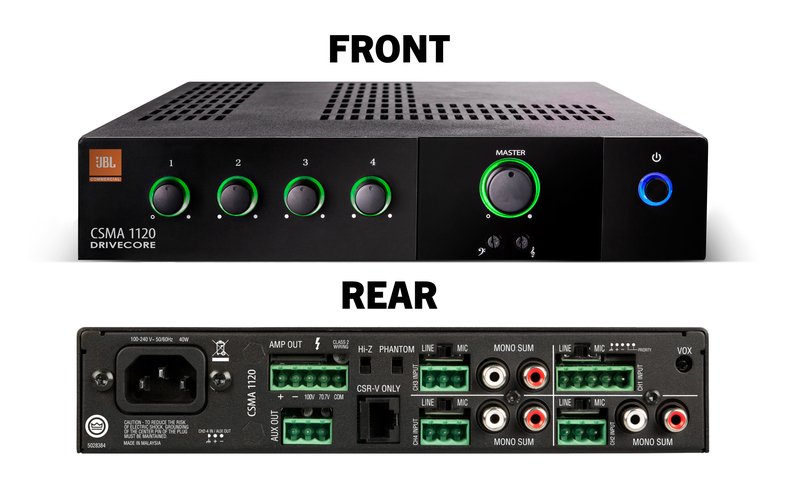 Those inputs are mixed down to a single 70V speaker output with 120W of power. The CSMA1120 even has a microphone input with voice priority so you can set it up as paging system that will duck out the music for any pages that come through. The CSMA1120's highly efficient Class-D DriveCore amplifier makes these units environmentally friendly as they draw less power and due to their reduced size and weight, are cheaper to ship. The CSMA1120 mixer/amp offers unmatched ease of use, with a clean, front panel featuring only volume controls for each channel, master volume adjustment, adjustable bass and treble controls and a power switch. All the volume controls are surrounded by an illuminated ring, making them easy to see and operate in darkened environments. The amplifier can drive 8 ohm and 4 ohm loads and can be used with 70V and 100V distributed audio systems without the need for a separate transformer. In addition to balanced mic/line inputs, unbalanced RCA inputs and speaker connections, all units include RJ45 connectors for use with JBL CSR-V in-wall volume controls. All models feature a universal power supply which enables the ability to accept AC voltages from 100 to 240 VAC, 50/60Hz. Dimensions/td> 8.2" x 1.7" x 7"